Just as people I know have finally come round to using Pandora Radio I’ve grown sick of it. I can’t remember when I started using Pandora, and as you will see in a minute, that’s part of my problem with it. The first song I bookmarked was in March of 2006, but I think I may have started even before that. I can remember how excited I was about Pandora at first. I had been crawling the MP3 blogs, sampling bands, burning CDs for local friends, and listening to web radio station KEXP for the next band to fall in love with. I ran a mailing list called culture whore, where friends and I traded recs. It was a lot of work, frankly. Then I turned on Pandora, and it did it all for me. No more of the inevitable Mars Volta song in my KEXP stream — I didn’t like it, bam! it was gone. It was a radio station built exactly around my tastes, always expanding, and requiring no effort from me. A dream come true. And so I stopped trolling the blogs, stopped listening to normal Web radio, stopped making mix CDs for friends. I would just come in in the morning and turn on Pandora. And about 2 years later (in March of this year) I quit using it, finding that the two years I had used it had been a bit of a musical wasteland for me, despite all the great bands I had discovered. And the only explanation I could give was that it had “Muzak-ed my music”. They don’t like the lack of authorship: A web radio show of the KEXP or WFMU type is put together by a person. And to listen to it is in some sense to engage in a dialogue with that person. When John in the Morning — a DJ I have listened to since I lived in Seattle — when he plays a track off the new Pedro the Lion CD he’s making an assertion about that track, and when he follows one song with another song, moving from Sense to early Portishead, that’s something we can mentally give a thumbs up or thumbs down to — in a way that is just impossible with Pandora (sorry). They don’t like the lack of an object: A radio show that occurs on Wednesday from 10 a.m. to 1 p.m. is an object for discussion. So is a mix CD, or an album. People can listen to the exact same thing and discuss their different reactions to it. A canonical object is a shared cultural experience in a way that a randomly mixed personal playlist is not. And while I can share my “station” in Pandora, it merely replicates my preferences — no person is hearing the same songs I am in the same order, never mind the same time. I’m back to albums and radio stations now, and it feels good. My daughter and I have been listening to the new Submarines album, and I have no doubt that she is creating memories too. I’ve re-engaged with my mailing list, and put the music blogs back into the RSS. And it feels human. It feels like waking up after a long slumber. That’s the problem with the Web 4.0 vision of intelligent agents — without intent and authorship and humanness — at least as part of the equation — having better music is somewhat meaningless. I’d rather have John in the Morning play stuff I don’t like 20% of the time and have that be a connection with authorship than Pandora play what I like a 100% of the time. What does that have to do with OCW? I suppose this. 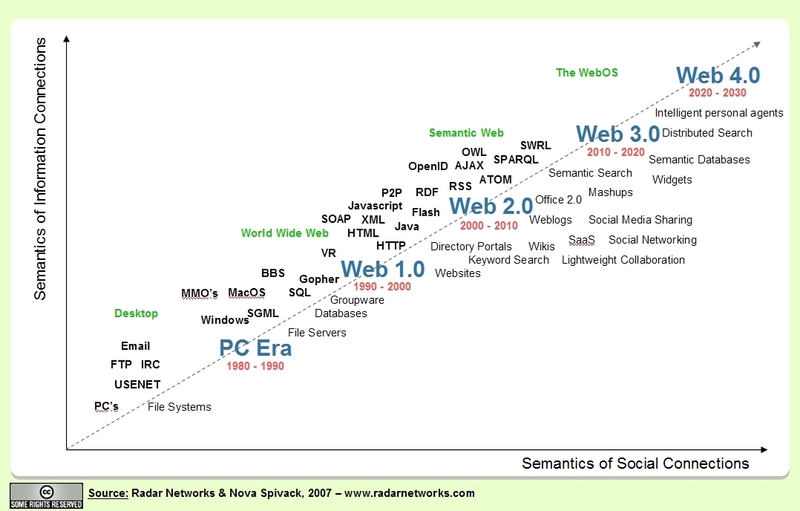 There’s some talk about OERs fitting into some kind of humanless delivery system — the dynamically assembled dream of Web 3.0 or 4.0 or whatever it is. That’s good for some things. But there is always going to be a hunger to connect with those larger authored enitities, big chunks of shareable cultural experience ordered sequentially and representing someone’s vision with which you’ll interact. Albums, Radio shows, Mix tapes, and yes, courses. If there’s a reason OCW matters in a world that wants to dynamically assemble OER it’s because the idea of authorship and voice is core to to our sense of humanness. OCW is like the album format — it’s not the only way to do authorship and voice, to humanize our efforts and allow us to share intentional experiences, but it’s one way. And that, ultimately, makes courseware worth doing, no matter what future technology may make possible. ← Note to Chronicle: I can haz trendlines? On point a, I’ll just say this is coming — at least the push for it. Intelligent Agents are a product, blog-based networks are not — that means intelligent agents will be pushed. And the message will be to cut that messy humanness out of the equation. They will ultimately lose, but the argument is on it’s way. On point b, I’ll concede. Still, if I can enjoy an album in an age of digital download, if it can still be a meaningful unit despite it initially being a product of encoding limitations, I have no doubt that courses, whether they be two sessions or twenty, will still continue to be a useful mode of delivery. I’ve never been a huge fan of Pandora (use it sometimes, don’t dislike it) because I find the entire concept of algorithmic similarity to be suspect. Algorithms generally can’t, so far, recognize the connections between songs that I find most interesting. Maybe this is another reason that radio can work better. On the other hand, do you really think, with most albums of the last couple of decades, that you could tell the difference between an album composed and selected by a group or musician from one that was selected from a pool of songs by a computer (or a soulless label rep)? I suspect that, for the most part, none of us could since the album no longer (generally) represents a thoughtful selection but is a collection of songs meant to be singles– which is even *worse* than Pandora! I’m not sure I’d put your comments here in opposition to intelligent agents– there’s plenty of role for them in many areas even if this one were set aside. And in most cases they don’t need to be as smart as us or human, they just have to be smart and human-like enough. they already are smart enough to replace most of our DJs up here in the far north… but that isn’t saying much! I suspect that, for the most part, none of us could since the album no longer (generally) represents a thoughtful selection but is a collection of songs meant to be singles– which is even *worse* than Pandora! Yes, this is a problem — and not one that was brought on us by technology, but by business consolidation. Still, I think there’s good albums out there for those into the indie scene. The Blizen Trapper Furr album is beautiful front to back, the King of Prussia EP is a genius 7-track odyssey. Vampire Weekend’s album in January was one of the best debut dics I’ve heard in ages — I’d put it next to any debut album in the last 20 years on execution of concept. I think part of my slant is that Web 2.0 is supposed to help fix that culture of the album as collection of singles. That by subverting the A&R radio scam, we get rid of this payola induced nightmare back to stuff with some real weight. Pandora seemed to do the opposite for me, although maybe others use it in a more responsible, less brain numbing way than I.
I do find it odd that you would prefer 80% stuff you like chosen by a person than 100% chosen by algorithm. If a DJ regularly picks out music I don’t like, then I’d stop listening. At what point does that cross over for you– would 90% music you don’t like be better because it was a human selection? 80%? I may have not been clear here: I actually *like* being presented with songs that don’t move me — as long as it’s by a DJ I trust. It forces me to open up to it, to give it a chance. I’m not sure why that is a more meaningful process with a “real” DJ, but it is. May be a mental block on my part. Maybe I hit the thumbs down on Pandora too fast. On WFMU there’s a DJ that often squeezes in a The Four Tops song into the set. And Four Tops is something I generally will flip past. But in that context, he’s built up a trust with me, and I’m ready to be open to it — and after a bit of not really getting it — I suddenly get it… does that make sense? Once again, whether one could achieve the same results with Pandora, I don’t know. I just know that for me, that sort of experience disappeared. I remember in my high school and college days tentatively entering the local CD store (in Logan, Utah it was Blowfish, which was consumed later by Graywhale) and hesitantly asking about this or that CD with the expectations that it would have to be special ordered. Every once in a while the clerk would ask me about the artis/music and we’d hit a conversation on styles, genres, and artists. On a good day this would lead to me discovering a new artist that I’d die for, though more often than not I would be fairly uninterested. I don’t use Pandora. I casually listen to the radio, but never with the expectation that I’ll find something I love anymore (though I did do that at one time, on some stations, for some programs–but whether it’s me that’s changed or the radio, that doesn’t seem to work for me anymore). Like Chris said I’m suspicious of algorithms that determine similarity except, like emusic’s, when they are based on some commonality in user selection. What I have learned to trust with almost full reliability is artistic connections. For example, my fanaticism for Nick Cave led me in many musical directions: Mick Harvey was in Crime and the City Solution while he was in The Birthday Party, and I love the BdayP and recognize Mick’s style, therefore I should check out Crime. Crime featured Simon Bonney, who’s voice was always spot on even when Crime’s songs were not, therefore I might like his solo work). Blixa Bargeld played on Mutiny/The Bad Seed, and he has a German band who is released on the same label (and advertised on the same page) as New Fast Automatic Daffodils, who are weird but I “get”, therefore I should check out Einsturzende Neubauten. Etc. On the flip side, if as a college Freshman I was wild about Possum Dixon in a quirky, Possum Dixon-esque way but found out that Rick Ocasek was producing there next album I would know that I respect but am not a big fan or Rick Ocasek or The Cars and therefore might not dig his influence that album (I didn’t). So for me capturing artistic connections is important–if we could do that better with technology, great. I think we could apply this to OER, so long as we track authorship in some meaningful way. And while I’m thinking about it, I trust music fanatics second. I trust user-based similar algorithms third (e.g. emusic’s). I trust friends fourth. I trust the radio last. Keep in mind, BTW, that I’m not talking about commercial radio — but rather, about college radio shows streamed across the web run by music fanatics. So if we can agree on that distinction, I think we’re in the same boat. We agree on that distinction. We don’t have a lot of indie radio in Utah, but there are a couple of gems. For instance, here in Utah County we have KOHS, a high-school run radio station that every once in a while manages to grab me by both shoulders. Of course you can guess it’s on the more raucous end of the spectrum, but I certainly have a broad raucous facet of my crystallizing music collection. but i only listen to last.fm about 20% of my listening time. i also love internet radio and listen to my favorite shows and DJs all over the country. i realize not everyone is as nuts about music as i am or you are, but if you love music and the web, you have to mix it up, share it, and engage with it.